Although the above quotation is a little too close to the “techie” jargon all too prevalent in the technical theatre world, it says a lot about the power of Gaffer tape. Many shows have relied on it’s mystical properties, as well as it’s ability to solve numerous problems. Here are some commonly used consumables in the theatre, and how they’re used. 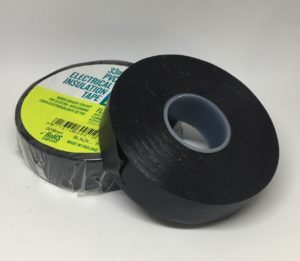 PVC Electrical / insulation tape is used for holding coiled cables together. Each time a cable is put into storage, it should be neatly coiled, with the coil held together by a short piece of PVC tape. PVC tape can also be used to code cables either to indicate ownership, or for marking cable lengths, or for holding cables neatly to lighting bars. A more environmentally-friendly alternative is to use reusable velcro cable ties, which remain fixed to one end of the cable. Although they’re more expensive initially, they’re faster to use, and can be printed with the venue or hire company name, making ownership easier to identify. Also known as LX Tape, Leccy Tape, Peev. Available in many different colours, although the standard is Black 50mm wide (usually on 50m roll). Used for holding cables in place on the floor. Great care must be used when using gaffa tape on painted surfaces (walls) or any polished surface, as adhesive residue may be left behind. NB: Brown Parcel tape / Packing tape must never be used for anything other than cardboard boxes as it is very difficult to remove and will leave glue all over the cables and floor surface. Lighting gels are available as large sheets (Rosco Supergel sheets are 500mm x 610mm) or as rolls. The gels are then cut to size according to the lanterns in which they are to be used. 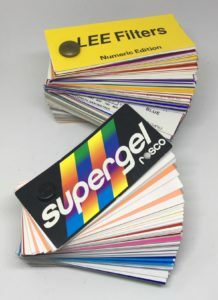 Care should be taken to label the gels with their colour number (and size if appropriate). A chinagraph pencil or marker pen should be used for the purpose. See Choosing and Using Colour for more information. There is a massive range of different lamps available for theatrical use. It pays to do some research about the manufacturers rated life for each lamp type you need. The 1000W T19 (used in Strand 1kW Frensels) has a life of 750 hours whereas the 500W T25 has a life of just 300 hours. The T25 (500W) is often interchanged for the T26 (650W) – as well has having a brighter output, this lamp has a longer life at 400 hours. It’s vital to let lanterns cool down before derigging or moving them as the lamp filaments are very vulnerable to damage when they’re hot. The same applies when focussing – try to focus the lantern as soon as possible after it’s been turned on. Try to avoid turning the lamps on, then spending 5 minutes moving chairs and erecting a ladder – the lantern will be hot, and it’s very easy to cause the lamp to blow as you’re focussing it. It’s imperative to have a stock of at least two of every lamp you need for the lighting rig. If you’ve got a number of different types of lanterns, you may need a different lamp type for each. Talk to your supplier about whether it’s possible to change lamps in some of your lanterns to simplify things and reduce the need for a wide range. Keep a stock of popular lamps. 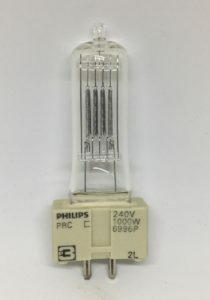 You can often get discounts for buying in bulk (quantities of 5 or more) and it’s often the case that suppliers have special offers on particular lamps. Keep in touch with your suppliers and make sure they inform you of any deals in the future. Essential for backing up data files, transferring audio or video files from one place to another etc.